Bartholomew is my great grand uncle, he is the older brother of Thomas Shannon, my great grandfather. I know this for certain as my cousin Barry has a photograph of his mother, Kathleen Ward, as a little girl with a young woman with the words 'cousin Lucy Shannon'. Lucy is the daughter of Thomas Shannon who is one of Bartholomew's sons. Michael Shannon is the father of Bartholomew and my great grandfather and I am guessing that their mother was called Mary Ann. I say this because children usually baptised their first children with the names of their parents; Bartholomew's first girl was called Mary Ann, as was Thomas's. I don't know whether Bartholomew and Thomas had any other siblings but the likelihood is that they would have come from a large family. They were born in Ireland. I think it is highly likely to be Sligo, partly because this is what it says on the 1911 census for Thomas Shannon, my great grandfather, and partly because Bartholomew Shannon marries Bridget Walsh in Achonry, Tobercurry, Sligo. Bartholomew had been married before and on searching the records I came up with a marriage between Bartley Shannon and Mary Sweeney on 11th February 1866 at Tobercurry. Bartley's father is Michael Shannon and an 'other' is Eduard Sweeney. I found this in the Irish Civil Registration Indexes. On 8th April 1867 Bridget Shannon is baptised in Tobercurry; her parents are Bartly Shannon and Mary Sweeney. Mary Shannon dies in 1869 at the age of 20 years. Of course I would need to acquire all the relevant certificates to confirm this but it seems likely given that when Bartholomew marries Bridget Walsh, he is down as a widower. I don't know what happens to Bridget Shannon, I cannot find any death records for her but it seems likely that she died otherwise she would have been living with Bartholomew and his new wife and family when they had moved to England. Bartholomew marries Bridget Walsh in Tobercurry on 6th April 1871 at the RC Chapel of Achonry. Bartholomew's father is called Michael and is deceased but was a land holder; Bridget's father is Pat and is also a land holder. This is information from the marriage certificate. The marriage certificate also tells us that Bartholomew lived in Leitrim and Bridget in Dohern. While searching for Leitrim and Dohern in Sligo I came across a death notice for a Tom Walsh, late of Dohern, Chaffpool, Tubbercurry. 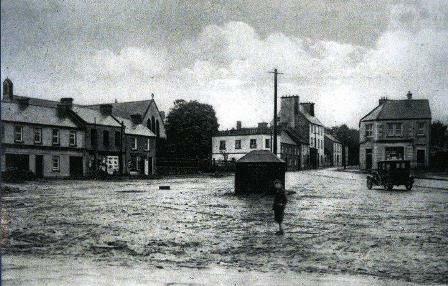 Chaffpool is very near Leitrim South; both are close to Tubbercurry. So I am guessing this is where Bartholomew and Bridget lived. Bartholomew and Bridget have their first child, Patrick, whilst still in Ireland. He was born on 17th February 1872 in Tobercurry. 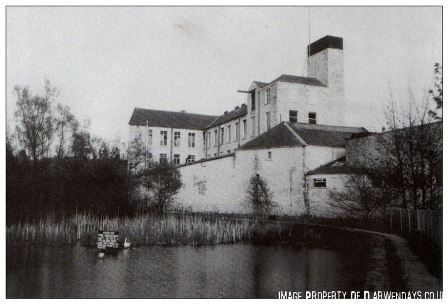 Here is a link which includes some history and old photographs of Tobercurry. Tobercurry, or Tubercurry as it is sometimes known, is the second largest town in County Sligo, despite only having a population of 1,747, and lies at the foot of the Ox mountains. At some point in the next two years the family move to Halifax, West Yorkshire. It is here that Thomas (1874), Michael (1875), John (1877) and Mary Ann (1880) are born. 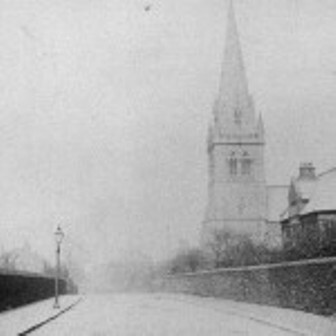 It is highly likely the children were baptised at St Mary's in Gibbett Street. © Copyright Humphrey Bolton and licensed for reuse under Creative Commons Licence. I need to go down to the archives in Halifax to see if I can access any information. 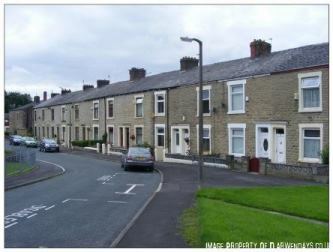 Thomas and Bridget Shannon were also living in Halifax at about this time as their daughter, also called Mary Ann, was born at 4 Walkers Court, Haley Hill, Northowram, Halifax on 7th June 1878. I am guessing Bartholomew and his family were probably living nearby. 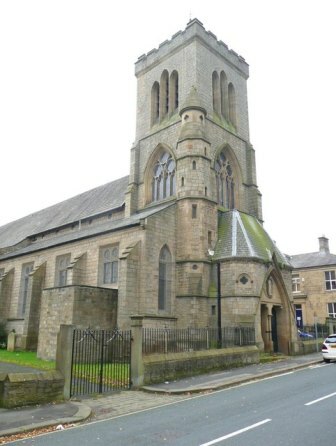 Bartholomew and his family had moved to Darwen by 1881 (whilst Thomas and his family had already moved back to Lancashire, to Blackburn). This is the first census Bartholomew shows up on. He is 40 and his wife Bridget is 30. Bartholomew is a general labourer. Thomas is 7, Michael 5, John 4, and Mary Ann 1, so they can only just have moved to Lancashire. Bridget's brothers, Patrick 27 and James Walsh 22, are also living with them, both are general labourers but are unemployed. They are living at 15 Livesey Place; Livesey Place comes up several times in our story: in 1901, Bartholomew's brother Thomas and his family are living at 14 Livesey Place (they were already there in 1897 as this is where they lived when their daughter Mary Ann got married), whilst in 1889 Thomas' mother-in-law, Catherine Farrell, is living at 16 Livesey Place when she dies 15th March. 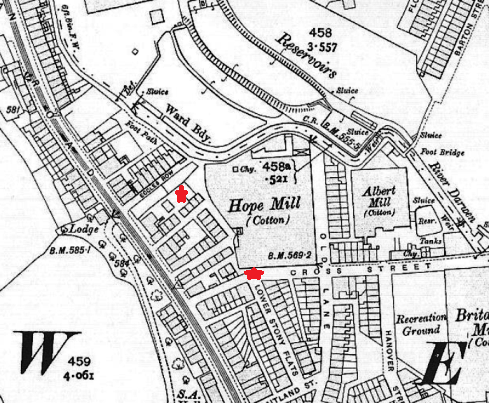 Here is an extract from a 1910 map. Bolton Road, the main road through Darwen, is on the left. 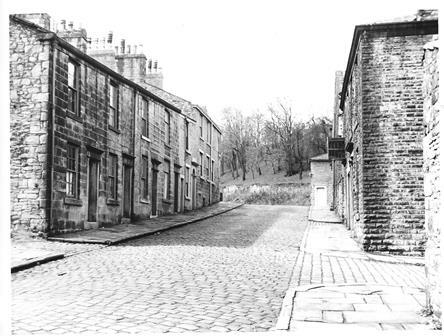 Livesey Place is just after Eccles Row on the census. Bartholomew's wife, Bridget, dies in 1890 at the age of 40. The family are probably already living at 38 Lower Stoney Flatts which is where they are in the 1891 census. Bartholomew is 50 and now working as a pipe maker. His sons, Patrick 19, Thomas 17 and Michael 15 are also pipe makers. It is likely they worked at Turton Moor Sanitary Pipe Works which was probably about 2 miles from where they lived going up the main road, past Bull Hill towards Turton. John is 13, Mary 11, Bartholomew 9, Margaret 6, Ann 3. The last three had all been born in Darwen. Hannah Barrowcliffe, aged 19 years, also lived with the family as a servant, she marries Patrick Shannon on 4th May the same year. Ten years later and Bartholomew is still at the same address. 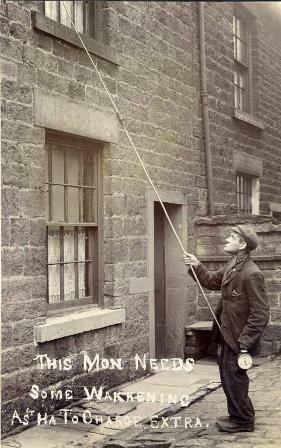 Still living with him are Mary, who at 20 years of age is now a winder in a cotton mill; Bartholomew 18 and the census confirms that he works at the Sanitary Pipe Works; Margaret, 16, is a weaver; and Ann, 12, is also a winder. In the 1911 census Bartholomew is down as being 74. He still lives at the same address and is a knocker upper (he went around waking people up for work). With him is living his daughter Annie who is now married, her husband William Hindle, a weaver, and their two children Margaret 2 and John who is 4 months old. Annie is a winder. Bartholomew dies three years later, in 1914. This is what happens to his children. On 4th May 1891 Patrick married Hannah Barrowcliffe at St John's. This suggests that Hannah was Church of England. Patrick was 21 and a labourer, Hannah 20 and a carder (carding room): Carding machines perform a combing operation, aligning the fibres so they will make a strong thread when spun. The process leaves the operator covered in cotton fluff. Seen as a low-status job by others in the industry. Both lived at Stoney Flatts. Patrick's father is, of course, Bartholomew and is down as a labourer whilst Hannah's father is William Barrowcliffe and is a grinder. The witnesses are John Moran and Mary Elizabeth Tatham. Patrick and Hannah have three children but, sadly, all three die in infancy: William (1902-1902), Ellen (1903-1904) and Bartholomew (1907-1909). Hannah is down as wife to the head of the family but Patrick is not there. She has been married 19 years and has put zero for children born alive, still living or dead. Living with her is her adopted daughter, Annie Scholes who is 8 years old and was born in Darwen. Hannah is a winder. Hannah clearly didn't complete the form as the signature is different to the rest of the writing. This could explain why no children have been put down. It looks like Annie Scholes was the daughter of James Scholes and Mary Meredith who were married in Blackburn in 1890. In the 1901 census James and Mary are living in Hoddlesden and have three children, William H 9, Mary Ann 7 and James 5. But I cannot find the family in 1911. I can't find any further reference to Patrick, Hannah or Annie Scholes.